From Goodreads ~ When her fiancé Rob breaks off their engagement for the third time, Viv does what any girl would do - she Googles "heartbreak". Viv is in her early 30s and had been dating Rob for five years. They've set a wedding date three times and she's sure it's going to happen this time ... until he informs her yet again he's not ready to get married. She impulsively tells him that she thinks they need some space and moves out figuring the time apart will make him realize what he is missing. 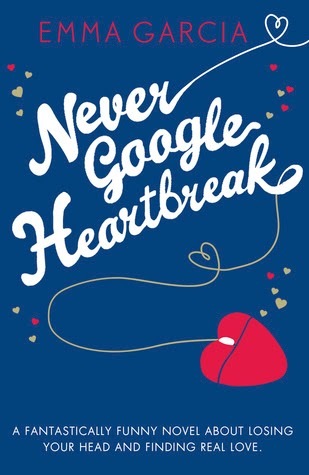 During their time apart, she Googles and discovers that there is a lot of heartbreak in the world. She makes plans to start a website as a place for those who have had their heart broken a place to go and commiserate. A month later, she is surprised he hasn't contacted her to get back together so reaches out to him ... and discovers that instead of pining for her, he has moved on with someone else. She tries to get him back and when it's clear it's not going to happen, she turns to her longtime friend, Max, for comfort. And that's when things get complicated! This is the first book I've read by this author and though the story was fairly predictable, I liked it. It's been a while since I've read some chick lit. I liked the writing style ... I thought it flowed well and was funny at times. It's written in first person in Viv's voice. As a head's up, the language and activity if for a mature reader. The characters were interesting. I felt bad for Viv. She's had her life planned out as Rob's wife and the mother of his children ... and suddenly that was gone. She gave a good fight for Rob but I thought she should have backed down once she discovered he had moved on with someone else ... I thought her actions were too desperate. I didn't like Rob but I don't think we weren't supposed to like him ... he's a rich arrogant guy and it's all about Rob. I didn't care for Lucy, Viv's friend, either. She has a successful career and I found her sluttiness too much of a conflict. Max was a fun goofy guy and though he never pushed her, he was finally able to be honest with Viv after many years.